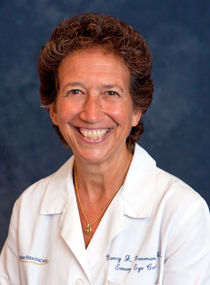 Nancy J. Newman, MD, was appointed LeoDelle Jolley Chair of Ophthalmology by Emory University School of Medicine in February 2002. She also holds the positions of professor of Ophthalmology and Neurology, and instructor in Neurological Surgery at Emory University School of Medicine. She also is director, Section of Neuro-Ophthalmology, Emory Eye Center. Dr. Newman has more than 450 publications, including scientific articles, book chapters and books, including the primary textbook in neuro-ophthalmology, Walsh & Hoyt’s Clinical Neuro-Ophthalmology, 5th and 6th editions. She is co-author, with Valérie Biousse, of the textbook, Neuro-Ophthalmology Illustrated (Thieme), the first edition published in 2009, and the second edition in 2016. She has served on the editorial boards of the American Journal of Ophthalmology, the Journal of the Neurological Sciences, Seminars in Neurology and the Journal of Neuro-Ophthalmology. Dr. Newman has lectured widely throughout the world and is known for her innovative teaching style. She sees both adults and children with neuro-ophthalmologic problems, such as optic nerve disorders, visual field defects and disorders of ocular motility. Her main research interests include disorders of the optic nerve and mitochondrial diseases. Dr. Newman is a fellow of the American Academy of Neurology, the North American Neuro-Ophthalmology Society, and the American Neurological Association. Dr. Newman was named Teacher of the Year by the Emory Medical School First Year Class in 1992, and again by the Eye Center residents in 1994. She was awarded the American Neurological Association’s (ANA) Distinguished Teacher of the Year Award in 2003 and the Emory University School of Medicine’s Dean’s Teaching Award in 2004. She was elected President of the North American Neuro-Ophthalmology Society on July 1, 2014. She was a recipient of the Research to Prevent Blindness Lew R. Wasserman Merit Award. Among her many named lectureships are the prestigious William F. Hoyt Lecture for the American Academy of Ophthalmology (2013) and the H. Houston Merritt Lecture for the American Academy of Neurology (2017). She is consistently named in Atlanta magazine as a “Top Doctor" and in the “Top Doctors” in the neurology and neuro-ophthalmology categories in U.S. News & World Report, where she ranks in the top 1% of doctors so listed. Dr. Newman served on the Board of Trustees of Princeton University for 14 years and is currently a trustee emerita. She also served as President of the Princeton Alumni Association and Chair of the Alumni Council.